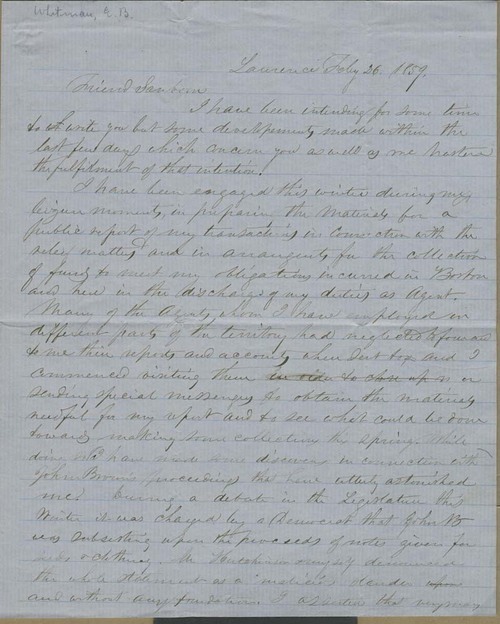 National Kansas Committee agent Whitman wrote to Sanborn from Lawrence with disturbing news about "John Brown's proceedings." Brown had been accused by Democrats during the previous legislative session of "subsisting upon the proceeds of notes given for seeds and clothing," and initially Whitman defended Brown against these charges--to Whitman's dismay, he later found them to be true. Whitman seemed sincere in his desire not to believe the worst about the man he had aided for several years, but he was at a loss for an adequate explanation for Brown's action under the guise of an agent of the National Kansas Committee.